Sustainable innovation requires evolution and revolution. Over the long term, organizations need to be capable of both moving along existing growth trajectories and creating new ones when the old business matures or stalls. This can be depicted as recurring movement along innovation s-curves. In the case of a new venture, acquiring lean start up skills can significantly increase the likelihood of successfully passing through the s-curve for the first time. Yet, research shows, only a minority of startup ventures are able to manage this challenging journey. Unlike Google, most of them struggle or are incorporated by bigger companies before they scale up. As Tim Kastelle points out, s-curves basically consist of the following stages (see figure below). Invention (Y): The time from when you first have an idea to the time when the idea is genuinely ready to spread. This can be, for instance, the application of a new technology or the development of a novel product. Diffusion: According to Steve Blank, this stage can be divided into two sub-stages, referred to as Search and Execution. Search (X): this period covers the search of a repeatable and scalable business model. 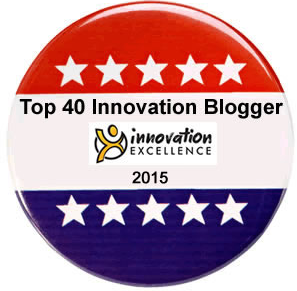 These activities usually involve early adopters to validate the innovation. Execution (following X): In order to spread the innovation, the business model is executed and continuously refined. Crossing the ‘chasm’ and scaling requires an appropriate value proposition in place. S-curves basically reflect value chains: innovation success is eventually determined by being able to scale novel ideas. Being first-to-scale, in turn, is based on inventing and properly validating the idea. One main characteristic of a chain is: it’s just as good as its weakest part. An important point here is that every stage requires dedicated capabilities and culture in order to be completed successfully and efficiently. Invention is mainly based on technical and research expertise, whereas the business model search process depends on hypotheses testing, experimentation and customer-related skills. 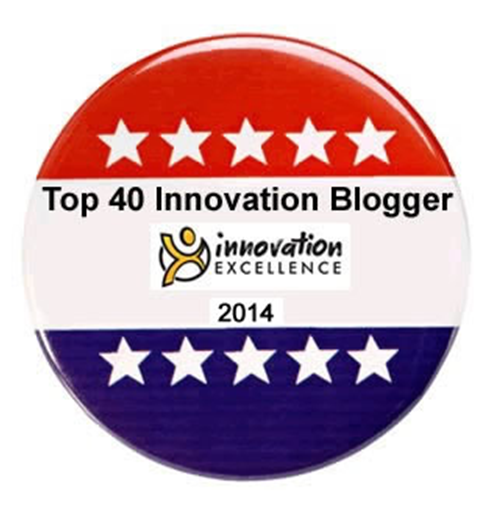 Finally, successful execution relies on commercialization competency and operational capabilities. The fact that firms that create new product and service markets are rarely the ones that scale them into mass markets carries serious implications for the modern corporation. Our research points to a simple reason for this phenomenon: The skills, mindsets, and competencies needed for discovery and invention not only are different from those needed for commercialization; they conflict with the needed characteristics. This means that firms good at invention are unlikely to be good at commercialization, and vice versa. We believe that big established firms do not have to be actively involved in both the colonization and the consolidation of new radical markets. Given their skills and attitudes, incumbents will be better off if they stick to consolidation, positioning themselves to exploit the pioneering efforts of others. One primary way established firms can accomplish this is by developing a network of feeder firms and serving as a venture capitalist to them. Major preconditions for the formation of these value networks are openness and the willingness to collaborate, rather than to compete to each other. Large firms take a key role as ‘interface’ to the market. They are required to tie open and customer-oriented business models by integrating and orchestrating their partner networks. “The most exciting new business models are networks connecting capabilities across boundaries“, says Saul Kaplan. Why? Simply: customer value doesn’t care about silos and boundaries. Organizational capabilities to reinvent and create new business models become more and more important. 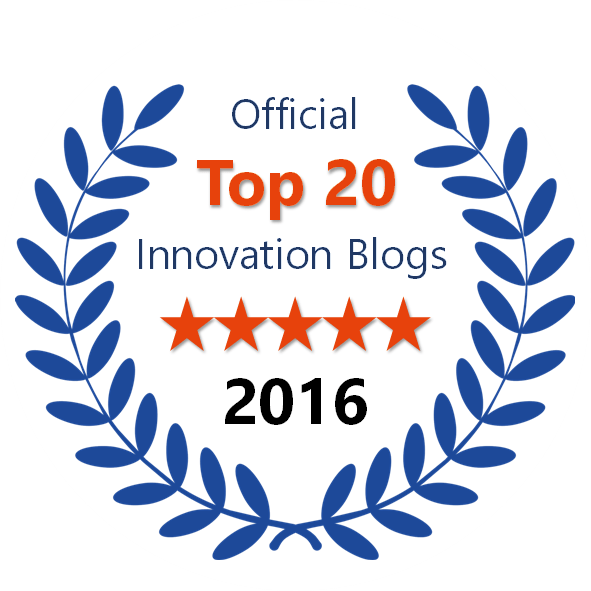 There are two reasons for this: Firstly, innovation activities tend to shift from product and process innovation towards business model innovation. 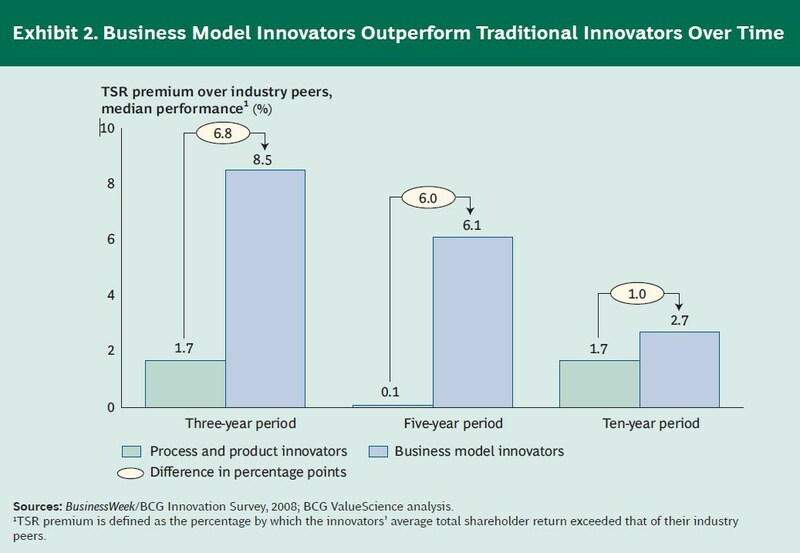 Secondly, business model innovators outperform traditional innovators (e.g. product innovation within an existing business model) over time. Large companies that make the successful transition to an open, collaborative style of innovation will emerge as effective ecosystem leaders. Such companies will find that their scale is a major asset for the kind of complex systemic innovation that will be increasingly important in the decades ahead. Taken together, all this seems to indicate that the future will be about open and collaborative innovation, benefiting from ecosystems with dedicated roles for all stakeholders. On the people level, corporate catalysts are then going to play an ever important role to drive innovation. Those integrators combine entrepreneurial spirit with an ability to leverage corporate resources and to orchestrate the diverse network. 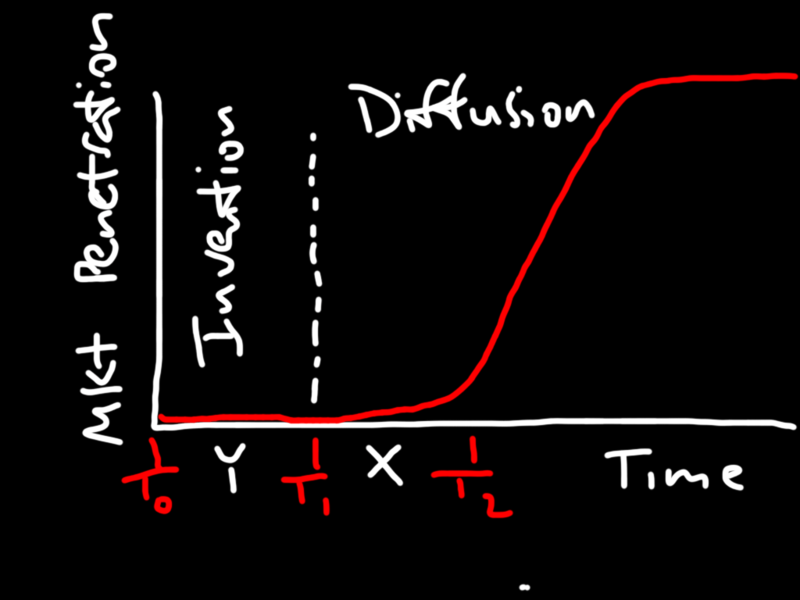 Sustainable innovation requires recurring innovation diffusion along s-curves. The different stages of the cycle demand distinct capabilities, cultures and mindsets. This suggests the formation of open ecosystems with dedicated roles for research organizations, startups and larger firms – in accordance with their natural strengths. Due to an ongoing shift towards business model and large-scale innovation, established firms will likely take a leading role in the future. On the people level, innovation is then primarily going to be driven by integrative thinkers with an ability to orchestrate the value network, referred to as corporate catalysts. I have two points: 1. Anyone seeking to collaborate with research firms, established firms or start ups needs to be aware of and make use of the following trading styles, which will be more or less appropriate at different collaborative stages: http://cuttingedgepartnerships.blogspot.co.uk/2015/09/trade-with-style-four-trading-styles.html 2. The ‘corporate catalysts’ will probably need to possess the following types of skills: http://cuttingedgepartnerships.blogspot.co.uk/2013/08/populate-your-partnership-with-new.html Thanks for your post. Thanks for your points, Charles!